What is Brand Identity? How to design and develop a great one. Let me start this article by asking you a question, what makes you uniquely you? Well, you may say that there are too many different things together make you as you. As your personal identity makes you uniquely you, your brand’s brand identity is something makes the brand uniquely that brand and set your company apart from any other A, B, C in a crowded space. And now comes to brand identity design, that’s something which shapes your company. But what the heck is brand identity? What does it have to do with business and design? And how can I shape a strong brand identity that makes people love my brand and take my business to the next level? Wait have a deep breath, we are going to uncover them all together. The best place to start anything is from the very beginning, so let’s dig deep into what exactly brand identity is. The terms “brand”, “branding” and “brand identity” are sometimes treated as interchangeable, but those are not the same. Brand is what your customers think about you, it’s the perception of a company in the eyes of the world. Branding is the strategy that actively shapes a distinctive brand and often times involve with marketing campaigns. And Brand Identity is the collection of all the brand elements of a company creates to distinguish the brand in the consumers’ mind. Your company’s brand identity is what makes your company instantly recognizable to your target audience. So what are the elements of a brand? We are going to discuss more about that in the next section of this article. All of these elements could be grouped differently, and that’s solely dependent on the team and brand. Such as how they want to create an impact on the market, how they want to develop their brand and there are too many different factors. A Brand should invest in a brand management system which will help them stay consistent and lead them to the success in today’s speedy market. As I described above that your brand identity portrait your brand in the consumer’s eyes, a successful brand identity will translate your brand to have a positive brand image. Strong brand identities are easily recognizable – and that immediately convey the message of that brand. Big companies like Nike, Adidas, Apple invest a significant amount of money on their branding efforts cause they know that it has an impact on their sales. But wait, Ash!! I am not running a company like Adidas or Apple, so why I should care about it? Well bud, I hear you cry!! You may not have a huge potential market like those big companies, but there are too many well-established benefits of having a strong brand identity which a small business can enjoy. When you have a strong brand identity you can take premium price. Why is someone will spend thousands of dollars more for a Lamborgini while he can take a Toyota? They are a similar product with the exception of some additional features and accessories. You can make the same argument with Apple products, many of their competitors’ products are a step ahead of them, (well, sometimes its the same), but their iconic brand is often enough to attract their customers for life. This is the power of branding and strong brand identity. For small businesses and eCommerce brands, a strong brand identity will position the brand in the mind of their customers as they are providing quality services and products they worth for paying. If you want to attract more customers and retain them then start spending money on branding and make a strong brand identity which they will love and trust. Recognition and loyalty: Customers are more likely to remember your business, and strong brand identity is the way to get in their mind. A meaningful or/and strong brand name, logo, and visual identity helps to keep your company in the mind of your target audience. If you are giving quality service, have a strong brand identity and your customers are happy with the products/service then it will make a loyal customer base around your business. Customers will more likely to refer you others if they have a positive feeling about your brand. Differentiation: As online businesses are being crowded and there are too many companies providing the same services online and offline. Companies are actively finding their way out to differentiate them from others. Only a strong brand identity can make you stand out in the crowd. For small businesses and eCommerce brands, investing in your brand identity will help you leapfrog others, bigger competitors and winning more customers. Color is an important element of any brand, it may make or break your brand and the sales too. Colors have a significant effect on humans’ emotional state. Your brand color scheme has the ability to impact your sales and performance even more than your products. So choosing a brand color is important, it really depends on your brand’s voice, vision and other important aspects. For example blue is more suitable for a technology venture, Red is for a company who wants to show something energetic. Choosing a brand color is easy if you know what you’re trying to communicate and what you want to say. Before choosing a brand color you need to determine your goal, perspective, and personality of your brand. You’ve to think your company as a person, who are they? What do they do? by asking these kinds of question you will determine that. Check What is branding? How to get started with that to learn more about Branding Strategies. Keep in mind that this is a basic theory of colors. For example, Yellow shows happiness but using too much Yellow color will make your customers anxious. If I want to talk about color theory then I will need to write a separate article on that. If you already have chosen a single brand color for your brand then you’ve passed the hard part already. Though that is not enough, now you’ve to choose a second and third color and combine them in the way you want. Keep in mind that every color of your brand color scheme should communicate the message you want. There is no right way to choose these colors and it’s not wise to strict with a method of choosing a brand color scheme. That being said, the process of choosing brand color would be daunting and hard sometimes. How your brand colors combine will come up again and again in different aspects of your business, your brand color scheme determines the look and feel of your business, website, eCommerce store design and on advertisements. So choose them very carefully. Instead of doing it yourself I would suggest you hire a branding agency for that. A well established Brand Identity Guideline is essential for developing a better brand. A brand style guide aka Brand Identity Guide help content creators and marketers communicate the right message with the customers in a consistent way. Its a great asset for developing a great brand. 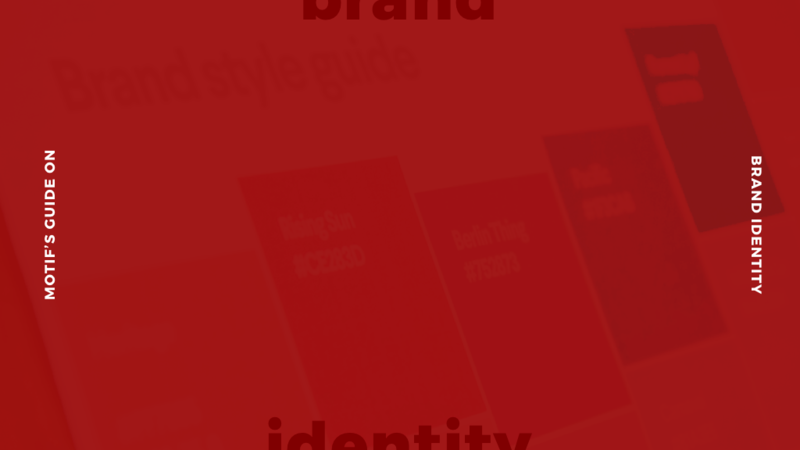 What Is Brand Identity Guideline? Brand Identity is a set of rules to create a unified identity when connecting multiple elements within a brand, such as colors, logo, and typography of a brand. Brand Guideline is a very useful resource for starting a new venture or rebranding an existing one. Brand Guideline determines how all of the element will be used in a brand. Color Palette: Those are the colors that make your brand up, as I explained above that it’s not wise to use too many colors for your brand identity design, choosing 2-3 colors is enough. A Brand Identity Guideline should include RGB and CMYK color codes so that your colors stay consistent between the digital and print version. Typography: A brand guideline also includes typeface, font families, font sizes guideline and the hierarchy of the used fonts for your brand. Logo Design: Though your brand is not only with your logo it’s an important element of your brand identity. How your logo should be displayed in different formats is an important part of your brand’s Brand Guideline. The brand identity guide could also include size restrictions, colors to use, and how your logo should be displayed on different backgrounds. Beside those necessary elements of a Brand Identity Guideline, there are few additional elements that may be included in “Brand Identity Guideline”. Imagery: Imagery guideline sometimes also being included in Brand Identity guideline. It could include the style of photography, wordmarks, illustration style and color guide, icons for your company uses on your website, and sometimes marketing materials. Brand Tone: As I explained the importance of brand tone you should always count on this thing and include brand tone guideline in your brand identity guideline. Brand tone refers to the words and the style of that your company chooses to use in order to show your brand’s personality and values. If you want to make a strong brand which is consistent across all the channel then you have to take it seriously, without a Brand Identity Guideline it’s nearly impossible to keep your brand’s identity consistent. Here are some of the reasons why you should care about brand guideline. When someone visits your website, sees your business card or receive adverts from you, they receive a perception of your brand other than the content they actually consume. By setting up set rules with brand identity guideline it becomes possible to communicate a consistent brand identity. To make your brand recognizable and reliable consistency is the key, it ultimately communicates in the right way with your audience and takes pride in the details. Again have a look at Nike’s Website and other channels you will get a consistent experience. When you will keep your brand and brand experience consistent across all the channels it will be more immediately recognizable within your industry and with your target audience. Building a recognizable brand is time-consuming but your brand could quickly be distinguishable by adhering your brand guidelines. Do you know how Google become one of the most recognizable companies? Have a look at Google’s brand guidelines. A Brand may get stretched too thin when they are introducing new products or services. By implementing a brand guideline, you have the tools to quickly and effectively maintain the consistency of your brand. And that way Brand Guideline helps you to aim your business’s interests with your target audience. Cohesive brand identity increases the brand’s perceived value. Consistency allows your brand to appear more professional and trustworthy. By implementing a brand guideline you make it easier to maintain the quality and integrity of your brand’s image. How Important is eCommerce Brand Identity Design? The importance of a strong eCommerce brand identity can never be ignored. It was important 5 years ago as well, however, with ever-changing technology and increasing competition in the eCommerce industry, it has become even more important. As I explained in our other articles how much important to have a brand strategy in place for standing out in a crowded marketplace, it’s the most vital part that can make or break your eCommerce business. There are thousands if not millions of eCommerce businesses available to shop from. When customers have more options, it becomes extremely important for an eCommerce business to have a distinctive presence to grab customer’s attention. Without a meaningful brand identity and branding strategy, you can’t cut through that. Building a truly great brand and getting closer to your target customers is an art in and of itself, for that you need to build a strong brand. Without a Brand Identity and Brand identity guideline in place, it’s nearly impossible. Whether your eCommerce business is big or small, local or international there are few tasks as important as branding.